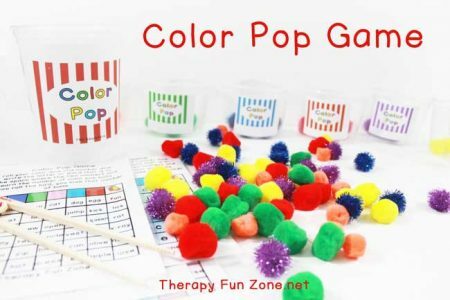 I use the color pop game all of the time in my therapy sessions, and it has become my favorite general way to work on skills and writing. The board has colors at the top, and numbers on the left, so the kids roll both dice to get their top color and their number. They then have to find the corresponding word or letter on the chart. Once they find their word or letter they can write it down. 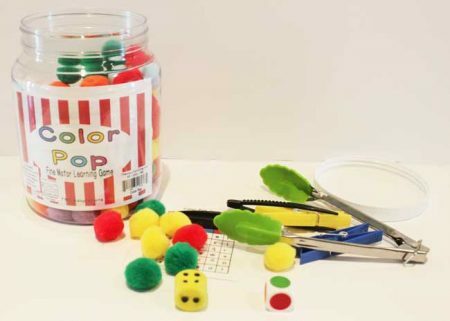 Lastly they pick up the right number of popcorn pieces in the color that they rolled, and put them in their container or spot in front of them. The winner of the game is the one with the most popcorn at the end. If I want to add more writing challenge, I will sometimes have the kids take their words and make them into a sentence. You can grade the difficulty of the activity by using chopsticks, spoon, tongs, or just fingers to pick up the popcorn. For younger kids, you can remove the writing and chart coordinates aspect and just have them count and get the right colors and put them into a corresponding container.